(Nanowerk Spotlight) The concept of self-healing has become a popular theme in the field of material science. The whole concept of 'smart' materials that react on external impact – pH, humidity changes, or distortion of the coating integrity – and repair themselves has experienced a tremendous boost with the advent of nanotechnology. The nanoscale multilayer structure of a coating, in which the components are integrated and mutually reactive, is a main point in sophisticated and strong corrosion protection (Nanowerk has reported on several recent activities in this area in previous Spotlights: Nanomaterial, heal thyself, Self-healing nanotechnology anticorrosion coatings as alternative to toxic chromium or Self-healing protection for plastic electronics). Researchers at the Beckman Institute at the University of Illinois at Urbana-Champaign have now proposed a new approach to self-healing polymer coating systems based on an electrospun coaxial healing agent. In a recent paper in Advanced Materials ("Coaxial Electrospinning of Self-Healing Coatings") they describe the effectiveness of such an approach to add autonomic functionality to polymer coatings. "We have demonstrated the concept of a coaxial electrospun self-healing polymer coating system for polysiloxane-based healing agents and an acrylate matrix," Paul Braun, a a professor of materials science and engineering, explains. "Electrospinning offers a number of unique opportunities. Perhaps most significantly, the location and concentration of the healing component can be spatially varied; this is in contrast to a capsule-based system, where the capsules are mixed into the matrix precursors before it is applied to the substrate." Braun, together with Jeong-Ho Park, the paper's first author, point out that the fibers are electrospun before the matrix is applied, thereby reducing a number of issues with chemical incompatibilities between various matrices and healing agents that are present when capsules are dispersed in the matrix precursors. "In a typical procedure, two viscous liquids are simultaneously fed through the inner and outer capillaries, respectively. If the proper combination of liquids and operation conditions are satisfied, a layered Taylor cone can be developed and a coaxial jet can be formed when a high voltage is applied to the outer metallic capillary. The electro-hydro-dynamic forces smoothly stretch the fluid interface to generate coaxial fibers due to the electrostatic repulsion between the accumulated surface charges." 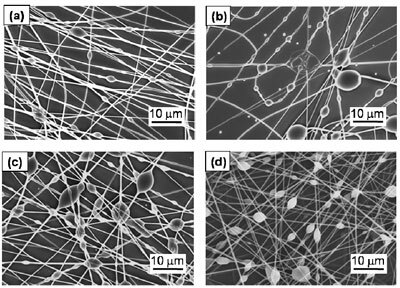 For this technique, the electrospun polymer nanofibers are randomly oriented on a surface with the liquid healing agent completely encapsulated in beads that are randomly distributed along the nanofibers. The capsules have to be quite susceptible to mechanical damage because successful self-healing requires the capsules to rupture upon a damage event. This being a two-part healing system, the beads contain one of two liquid polysiloxane precursors. Upon a damage event, for instance a crack, the beads rupture and the two precursor liquids are released into the damage area and mix in the vicinity of the existing coating where they polymerize, thereby filling the crack.